East End Provisions is located on the end of Broughton Street with its own parking lot. I ordered the Hunter Cattle Sausage Roll paired with Sweet Potato and Brussels Sprout Hash from East End Provision’s lunch menu. Benton Lee’s Steakhouse reopened its doors to the public in November 2007, after a grease fire burned the restaurant to the ground one year earlier. There are steakhouses, and then there’s Benton Lee’s. I have discovered the place to eat meat in South Georgia, y’all. If you’re looking for a good steak, stop your search right now and hop in your car for a drive through the country. Known for it’s large portions and family-centered atmosphere, the restaurant, with its wide front porch and back deck, overlooks the Altamaha River. For many reading this though, it won’t be a surprise. The locals of this community have enjoyed Benton Lee’s Steakhouse for 48 years. ❤ This guy makes my heart skip a beat. Nothing says romance like eating gator nuggets while watching the sun go down over the Altamaha. My good lookin’ husband, Kurt, and I drove over to the restaurant from Claxton, Georgia on a Friday night, just in time to catch the sunset. The child’s portion of Gator Nuggets is $11. We ordered gator nuggets to start, because that’s what you do when you live in The Fruitcake Capital of the World and no restaurant within a 30-mile radius has it on the menu. Much to my dismay, the gator served at Benton Lee’s is not wrestled and caught from the muddy waters of the Altamaha (ha! ), but sourced from a gator farm in Odom, Georgia about 300 miles away. Gator has a tough and chewy consistency, but everyone should try it once. Our server said he liked it better than chicken, but I’ll stick with poultry (spoken like a true resident of Evans County). My husband and I ordered the Sirloin for two (individually cooked) for $33. This is ONE portion. The straightforward menu features steaks of all cuts and sizes, plus seafood–shrimp, oysters and catfish–chicken tenders and wild game like quail, gator and frog legs. Staples including hamburger steak, pork chops and chef salad also are available. We ordered the Sirloin for Two: each serving is individually cooked and is at least 12 ounces. In the causal atmosphere, tea and water are self-serve. The beef served at Benton Lee’s is flown in from Utah. The hand-cut fries are perfectly salted and crunchy. My steak was cooked to a medium temperature, juicy and just right. Tender and warm from the grill, the steak melts in your mouth. Beautiful grill marks make an appetizing presentation, and a standard salad and roll round out the meal. I am told that once upon a time Benton Lee’s Steakhouse hosted a competition where if you ate six pounds worth of beef, you would get it for free. I don’t understand why anyone would want to do this. Eating at Benton Lee’s Steakhouse is like visiting your mama and ’em. The patrons at Benton Lee’s Steakhouse are the same folks you see on the church pew Sunday morning, the moms of the elementary school drop-off line and dads of the community ball field. They’re Southern folks that do life together, that appreciate a good slab of beef when they see it. This is not an audience concerned about locally sourced ingredients, a five star plate presentation, house-made sauces or compound butters. They’re not seeking white tablecloths or organic produce, just a place they can go with the family in tow for a hearty meal and a break from cooking themselves. Down home, friendly and no nonsense. My kind of place! Framed photos of celebrity visitors greet guests in the restaurant’s entryway. Celebrity guests have included country music sensation Travis Tritt, the late actress Donna Douglas (a.k.a Ellie May Clampett from The Beverly Hillbillies TV Show), Troy and Jacob Landry from the History Channel’s Swamp People and Duck Dynasty’s Si Robertson. It doesn’t get more country than that, folks! The walls contain an eclectic mix of taxidermy and farm equipment familiar to the South Georgia region. An antique hand mixer and some old Coca-Cola bottles decorated the shelf above our table. Every booth and table in the restaurant houses everything you need – paper towels, salt & pepper, ketchup, steak sauces and hot sauce. A well-lit jukebox stands near the doorway. Attentive servers wear bright pink t-shirts displaying the “Don’t Tread On Me” Gadsden Flag. A sign posted on the front porch of the property sums up the philosophy of Benton Lee’s well. Come hungry and come as you are. Georgia native Rebekah Faulk Lingenfelser is a freelance writer, entertainer and food enthusiast who writes and speaks about her love of good food and the Coastal South. A Season 2 Contestant on ABC’s “The Taste,” she is the former Statesboro Herald food columnist and past host of the television program “Statesboro Cooks.” From 2012 – ’14, she appeared regularly as Celebrity Chef at the Statesboro Main Street Farmers’ Market and wrote as a guest blogger for Visit Savannah and The Local Palate. In addition, her work is published in Moments magazine and Connect Statesboro. Her culinary accomplishments are recognized in two publications: She is a featured alumna in Georgia Southern Magazine (Spring ’14) and the “Go Girl!” in Moments magazine (March 2104), a tabloid for moms and modern women. To learn more, visit RebekahFaulk.wix.com/RebekahFaulk. I love discovering quaint, off-the-beaten-path delights. That’s what I would call Angel Oak Restaurant, a small, family owned spot on John’s Island. Located right off of Savannah Highway, about 10 miles from downtown Charleston, Chef Jay Kees is serving up some of the most flavorful Southern fare in the city, combining a balance of down home dishes with those that compete with the forward thinking, highfalutin’ standards of Charleston dining. That’s one reason it isn’t hard to believe Angel Oak Restaurant holds the title for longest running business in this location. Going on more than three years in service (they opened in summer 2012), the eclectic space was once a general store, a Mexican restaurant and an ice cream shop. The one room eatery holds 15 tables with bench style seating and an assortment of wooden chairs. Guests may also choose to sit outside, where bulb lighting and table lanterns create a soft ambiance. At the entrance, a large hostess station filled with paper menus and reams of craft paper greet guests. Staff members dressed neatly in blue jeans and plaid button down shirts work the dining room. Filled with intentional and meaningful details, the setting creates a warm atmosphere perfect for families or date night. Popular tunes play on the speakers. Small bottles filled with fresh flowers make inviting, simple centerpieces, coupled with a mix of blue, green and clear Mason jars for drinking glasses. Utensils rest comfortably on nautical cloth napkins. Open for lunch, supper and Sunday Brunch, I’ve had the pleasure of dining here on many occasions for all but supper. One of the most popular Sunday Brunch dishes has to be the House Made Beignets, a plate piled high with powdered sugar-dusted doughnuts, served with chocolate sauce. Reminiscent of dulce de leche, the sauce has sweet caramel notes. Other Sunday Brunch dishes include hearty selections such as Country Fried Steak and Eggs, Chicken and Biscuits, Bacon, Egg and Cheese Croissant, and the Croque Madame. If you enjoy a good champagne cocktail, the $10 bottomless mimosas make the restaurant a motivating choice. The Bacon, Egg and Cheese Croissant is served with your choice of one side, and a garnish of watermelon. Home fries make a crispy accompaniment. The Country Fried Steak and Eggs feature two buttermilk biscuits topped with collards and country fried steak, finished with poached eggs and gravy. Come hungry! Consistent with the widely held belief of many a good chef, the husband and wife team at Angel Oak Restaurant prides itself on sourcing local, seasonal ingredients to best highlight the cuisine of the community. South Carolina farmers and purveyors including Geechie Boy Market and Mill, Legare Farms, Blackbird Farms, Limehouse Produce, Saffron Bakery and Burbages provide fresh ingredients from breads and grits to produce, beef, pork and eggs. The restaurant boasts its own herb garden. The Croque Madame is my favorite dish yet! It’s a toasted ham and cheese sandwich topped with a fried egg, finished with mornet sauce and served with a bright arugula salad garnished with pickled red onion. Lunch, including a daily Blue Plate Special, features a variety of appetizers, salads and entrees. On my last visit, I ordered the sampler plate with Bacon Braised Collards, Tomato Salad and Mac N’ Cheese. Fresh and well executed, it was every Southerner’s taste of home. Mainstays like Fried Green Tomatoes, House Made Pimento Cheese and Fried Pickle Chips offer familiar comfort. A nice selection of local beers are available, along with a standard wine list. So, the next time you’re stuck in traffic on Savannah Highway, stop in to Angel Oak Restaurant. Unassuming and rustic, its recipe for success is clear: Quality ingredients, locally sourced + friendly service in a unique environment. What more could a diner want? Now based in Charleston, South Carolina, Georgia native Rebekah Faulk Lingenfelser is a freelance writer, entertainer and food enthusiast who writes and speaks about her love of good food and the Coastal South. 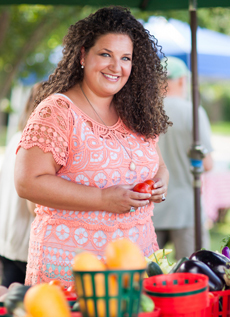 A Season 2 Contestant on ABC’s “The Taste,” she is the former Statesboro Herald food columnist and past host of the television program “Statesboro Cooks.” From 2012 – ’14, she appeared regularly as Celebrity Chef at the Statesboro Main Street Farmers’ Market and wrote as a guest blogger for Visit Savannah and The Local Palate. In addition, her work is published in Moments magazine and Connect Statesboro. Her culinary accomplishments are recognized in two publications: She is a featured alumna in Georgia Southern Magazine (Spring ’14) and the “Go Girl!” in Moments magazine (March 2104), a tabloid for moms and modern women. To learn more, visit RebekahFaulk.wix.com/RebekahFaulk. 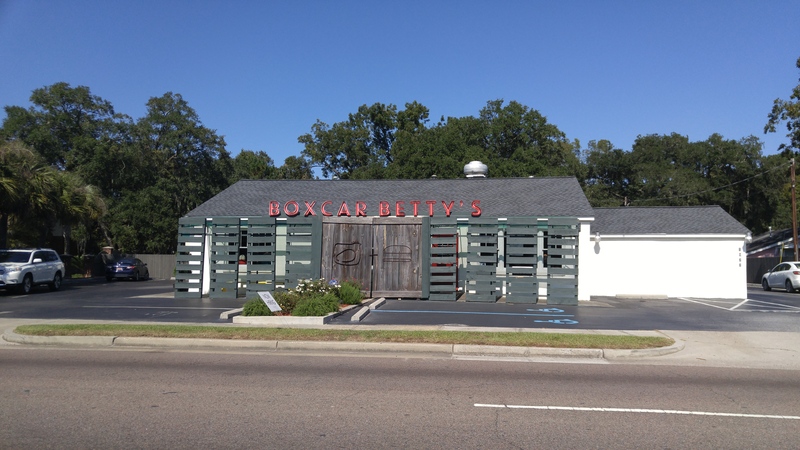 Boxcar Betty’s sits right off of Hwy 17 on the left headed toward Folly Beach. 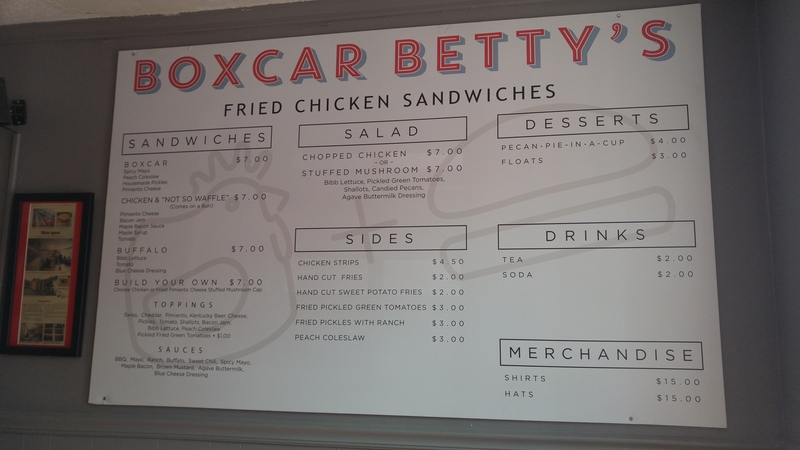 “This place is like a fancy Chick-fil-A,” said Kurt, my good lookin’ husband, as he took a juicy bite of his “Build Your Own” fried chicken sandwich at Boxcar Betty’s on Saturday afternoon. Kurt has a way of putting everything in layman’s terms, so there’s no mistaking the meaning. I thought his perception was spot on, as this “purveyor of gourmet fried chicken sandwiches” is known for its high-end take on a classic Southern delicacy. Their philosophy is simple: Pair the best chicken with locally sourced ingredients. They take one thing – fried chicken – place it between a soft bun – and offer a variation of toppings and sauces so customers can customize their sandwiches. This is a place where only FRIED chicken – not grilled, baked or roasted – reigns supreme. 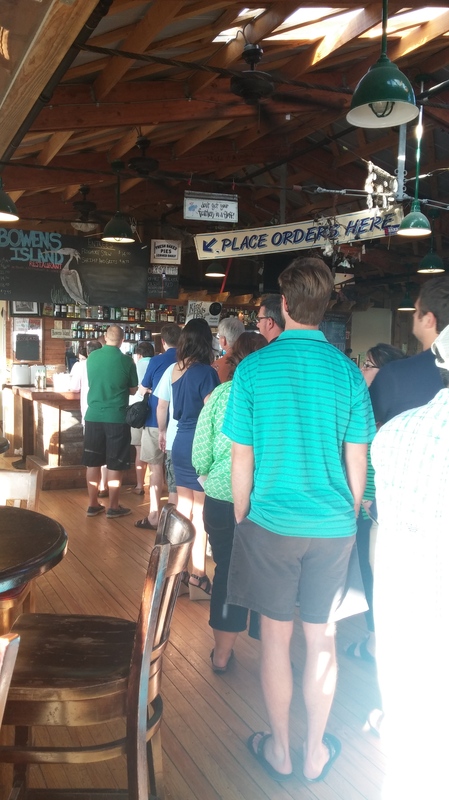 A large menu is front and center on the wall, as customers stand in line to place their orders. As a resident of West Ashley, I had driven by the place a hundred times. Intrigued by the look of the outside, and the inviting words “Chicken Biscuits” that often appear on the sign, we pulled in to discover a real delight. Upbeat music plays over the speakers, and regulars bring books to read by the window as they await lunch. 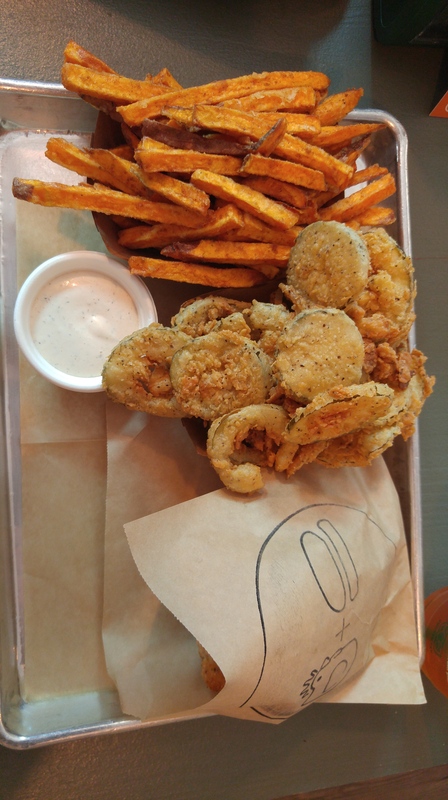 Fried Pickles between an order of sweet potato fries and a chicken sandwich. We started the meal with an order of fried pickles, served with house-made ranch dressing. With just one look, I could tell they were done right. Crispy with a thin coating of seasoned flour, the recipe starts with cucumbers sourced from Joseph Fields Farm in Charleston. Just $4 will get you an order. Check out Food Editor Hannah Raskin’s take on these pickles in The Post & Courier. The handcut fries (pictured below) are seasoned while they’re hot and have a nice crunch. Growing up at home, my dad would make them like this and let them drain on a paper grocery sack on the countertop. 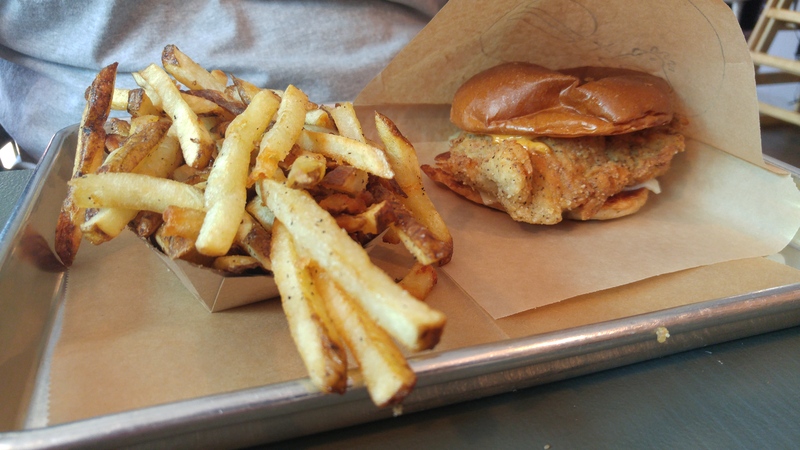 A custom fried chicken sandwich with handcut fries. Here’s how it works: You can choose from three predetermined sandwich options – #1 The Boxcar including pimiento cheese, peach slaw, house pickles and spicy mayo; #2 The Chicken “Not So Waffle” with bacon jam, maple syrup, pimiento cheese and tomato; or #3 The Buffalo with blue cheese sauce, tomato and bibb lettuce. If the three of those don’t get your mouth-watering, opt to Build Your Own, with toppings such as Kentucky beer cheese, sweet chili sauce or shallots. There’s something for everyone! Kurt built his own and kept it simple with Swiss cheese and honey mustard and an order of handcut fries, and I chose The Chicken “Not So Waffle” with sweet potato fries. That bacon jam combined with pimento cheese and the crispy skin of that fried chicken was SOME KINDA GOOD, now! With a big bite of my sandwich, I happily bobbed my head to the beat of Michael Jackson’s “The Way You Make Me Feel” as the lyrics perfectly echoed my emotions toward the sandwich. The space is quaint & cozy. Boxcar wall art fills the dining room. Customers receive a table number to take to their seats. Inside the restaurant, antique, exposed wood creates a retro vibe while a mix of colorful boxcar wall art and modern lighting combines old with new. Guests can sit on bar stools or at tables in the quaint dining area. Nothing on the menu is over $7, and aside from the chicken sandwiches, the menu offers chicken tenders for kids, and a few salads. Pecan pie is served in a cup and floats are also available for dessert. Chicken + Bun = Some Kinda Good! When you eat at Boxcar Betty’s, you’re also helping the environment. All the materials on your tray come completely compostable. 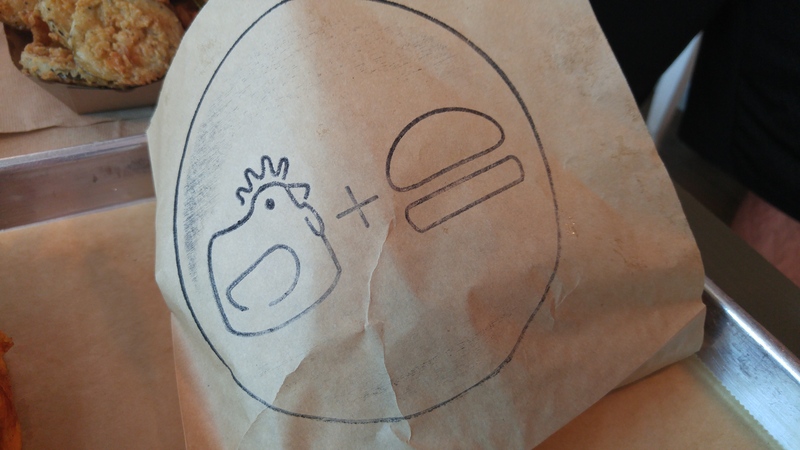 You’ll find the chicken + bun stamp on everything from the paper-wrapped sandwiches and order numbers to the front doors. If it’s fried chicken you seek, Boxcar Betty’s does it well. It’s refreshing to discover a place that takes pride in every ingredient. Dine here for a truly unique and memorable meal – they’ve genuinely mastered the art of the fried chicken sandwich! Now based in Charleston, South Carolina, Georgia native Rebekah Faulk Lingenfelser is a freelance writer, entertainer and food enthusiast who writes and speaks about her love of good food and the Coastal South. A Season 2 Contestant on ABC’s “The Taste,” she is the former Statesboro Herald food columnist and past host of the television program Statesboro Cooks. From 2012 – ’14, she appeared regularly as Celebrity Chef at the Statesboro Main Street Farmers’ Market and wrote as a guest blogger for Visit Savannah and The Local Palate. In addition, Faulk’s work is published in Moments magazine and Connect Statesboro. Her culinary accomplishments are recognized in two publications: She is a featured alumna in Georgia Southern Magazine (Spring ’14) and the “Go Girl!” in Moments magazine (March 2104), a tabloid for Moms and Modern Women. To learn more, visit RebekahFaulk.wix.com/RebekahFaulk. In my short six months as a Charlestonian, I’ve learned one very accommodating notion about the food scene: The Holy City offers a dining experience for every frame of mind. 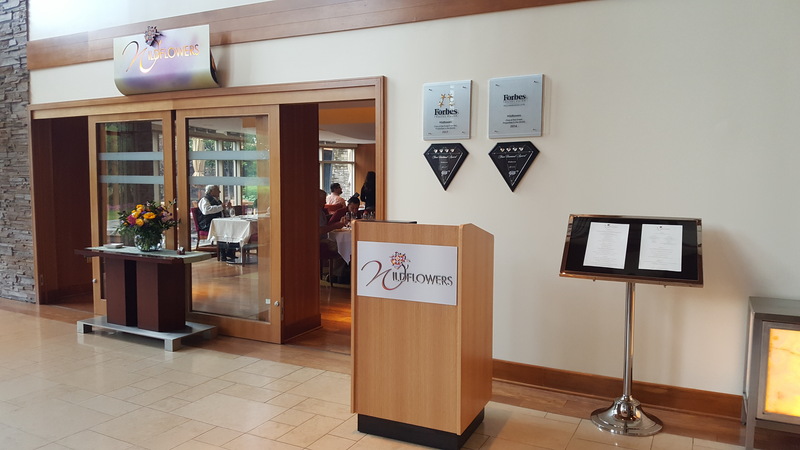 Without a doubt, diners will find their every hearts’ desire–Want high-end fare, served with keen attention to detail on white tablecloths to the tune of jazz music? How about brunch in a funky roadside dive or on the porch of a historic Victorian home-turned-culinary delight? 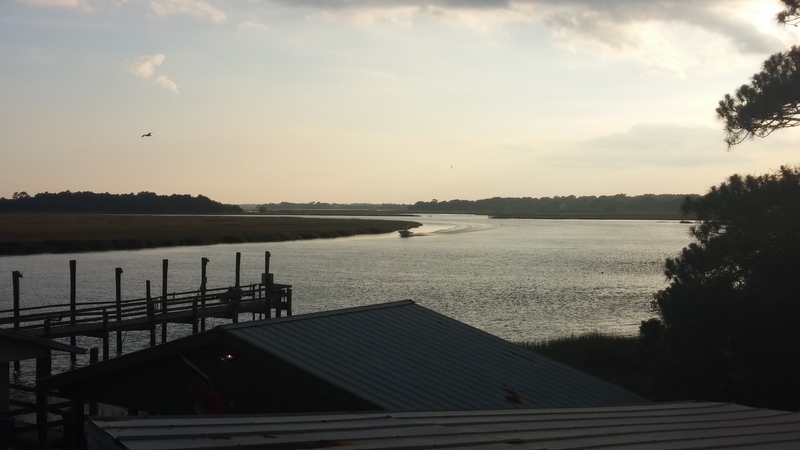 Maybe it’s serenity you seek in the natural surroundings of the Lowcountry–a place where you can gaze upon the marshlands while sinking your teeth into the ocean’s bounty. Chucktown has it all. While hand-crafted cocktails and perfectly plated entrées are a luxury, sometimes just the taste of crunchy fried shrimp or a good hush-puppy dunked in cocktail sauce and chased by a cold glass of sweet tea does the trick. 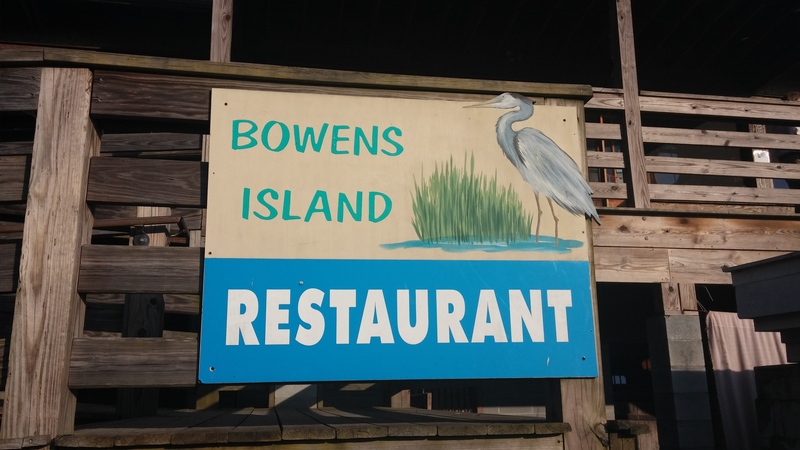 On a warm Friday night recently, I found such a place: Bowens Island Restaurant. Down home and casual as can be, you’d never know it existed (the restaurant has no website or Facebook page) unless you had a little insider insight. 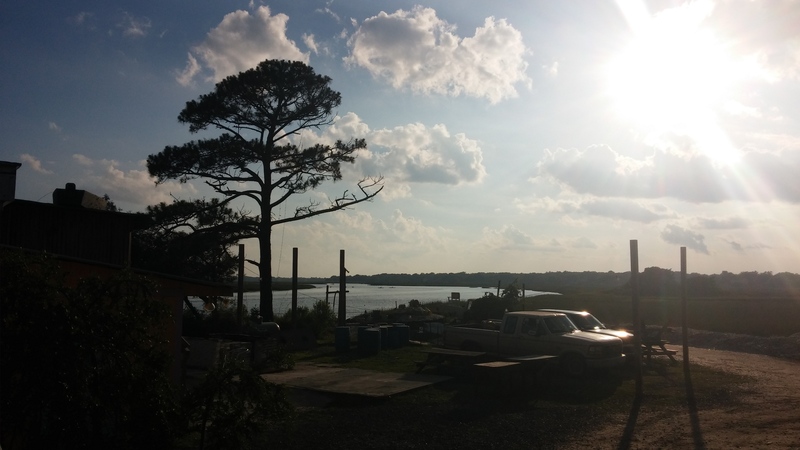 The view as you walk up the ramp entrance to the Bowens Island Restaurant. Just as traffic breaks free on the way out to Folly Beach, visitors will notice a large spray painted sign which points the way down a washed out dirt road to 1870 Bowens Island Rd. Take this road slowly, not just to avoid a flat tire, but because you won’t want to miss the glorious mansions on each side of the road, flanked by shade trees and grandiose Southern porches. Guests stand in line to place their orders. You’ll stand in line to place your order. It can be a long line, because people are willing to wait for good food. I met some friends there around 7 p.m. on a weekend, and we waited about 10-15 minutes. A boater passes by the docks at Bowens Island Restaurant. Views of boats motoring up to the docks, the smell of fresh-caught seafood and the sun setting over the water will keep you pretty entertained. Not to mention the anticipation of at least 10 local brews on tap. The indoor dining room at Bowens Island Restaurant. I love that I captured a family praying in this picture! Who wouldn’t want to watch the sun go down with a cold corona and friends here? Guests can sit on bar stools facing the water while dining outdoors. There’s not a bad seat in the house–or outside “the house” for that matter. Take your pick of where to rest your weary bones: Indoor dining room, indoor bar, or outside on the deck facing the water. Should you pick inside, be forewarned, there’s no air conditioning. Ceiling fans and the natural sea breeze keep the air circulating. The dining room is a bustling place. Waiters come barreling out of the kitchen with trays of hot fried seafood, hollering the name on your order. Boiled Shrimp served with fries, hush-puppies and slaw. I also got a local pale ale! A tray of hot seafood, chicken and fish being delivered to tables. Orders are served in recyclable cartons with plastic utensils. A big roll of paper towels sits on each table. The menu has everything from fried and boiled shrimp to in-season oysters and fried chicken tenders. The food is well seasoned, hot upon arrival and for those blessed to have eaten a lot on the coast, familiar. Unlike a large percentage of Charleston dining establishments, there won’t be an item on this menu you can’t pronounce or an ingredient you have to question. Hush-puppies, french fries and coleslaw come with just about everything. The “Big Ol’ Seafood Platter” is the most expensive thing on the menu, coming in at $19. Simple, and Some Kinda Good! The only sign posted on the two-story shack-like restaurant faces the gravel parking area. If your idea of a night on the town is a laid back, no fuss Lowcountry experience, this is your spot. Open six nights a week from 5 – 10 p.m., you can bet I’ll be there again soon, sipping on a cold Corona. Now based in Charleston, South Carolina, Georgia native Rebekah Faulk is a freelance writer, entertainer and food enthusiast who writes and speaks about her love of good food and the Coastal South. A Season 2 Contestant on ABC’s “The Taste,” she is the former Statesboro Herald food columnist and past host of the television program Statesboro Cooks. From 2012 – ’14, she appeared regularly as Celebrity Chef at the Statesboro Main Street Farmers’ Market and wrote as a guest blogger for Visit Savannah and The Local Palate. In addition, Faulk’s work is published in Moments magazine and Connect Statesboro. Her culinary accomplishments are recognized in two publications: She is a featured alumna in Georgia Southern Magazine (Spring ’14) and the “Go Girl!” in Moments magazine (March 2104), a tabloid for Moms and Modern Women. To learn more, visit RebekahFaulk.wix.com/RebekahFaulk.